Dartmouth scientists have shown for the first time how winds blowing across lakes affect the chemical makeup of water vapor above and evaporated from lakes, which may aid research into past and present water cycles under changing climate. The findings, which appear in the journal Quaternary Science Reviews, are important because isotopic compositions of evaporation are used both by hydrologists who want to understand lake water balance and by paleoclimatologists who use lake isotopic records to reconstruct past climate. A PDF is available on request. Evaporation is a vital part of the hydrological cycle, and isotopic compositions of lakes' vapor fluctuation are used to quantify regional water balance and to understand past climate records. In the Arctic, where lakes cover as much as 30 percent of the landscape, lake evaporation accounts for a significant amount of surface water flux. Knowledge of this flux is thus important to understanding the hydrological response to climate change. Changes in the Arctic's water balance are also inferred from ancient lake records obtained from sediment cores, which reflect changes of climate variables such as precipitation and evaporation. Quantifying evaporation changes is thus a critical part of paleoclimate studies based on lake sediment records. The Dartmouth researchers focused on evaporation of three lakes 40 meters to six kilometers long on the tundra near Kangerlussuaq, Greenland. At each lake, they made meteorological measurements, including temperature, humidity and wind velocity. Water vapor above the lake and lake water were measured for oxygen and hydrogen isotopic compositions. Results showed that the evaporation rate and the isotopic ratio of the evaporated vapor are affected by winds blowing onto the lakes. Near the upwind shore, the evaporation rate is relatively high and deuterium and oxygen-18 (stable isotopes of water) abundances in water vapor flux are relatively low because the air blowing from land is dry. With distance, evaporation occurs and humidity increases, slowing down the evaporation. 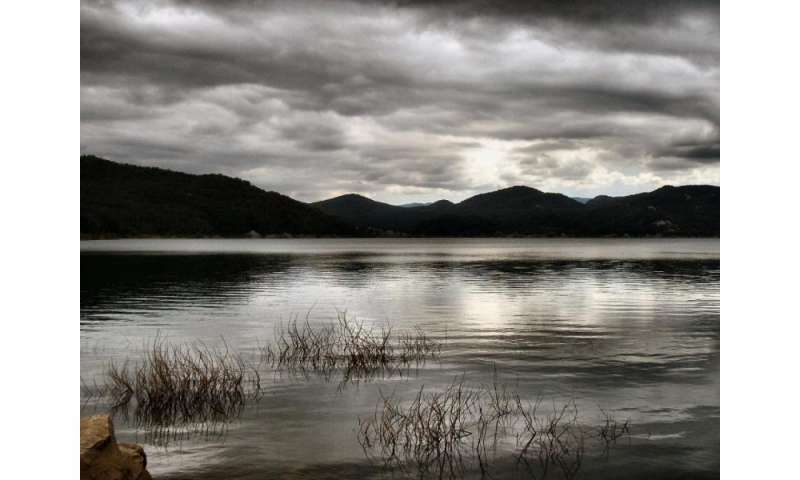 For the first time, the researchers observed the vertical and horizontal components of vapor and isotopic gradients as relatively dry and isotopically depleted air moved across the lakes' surface. Since wind advection - or wind blowing horizontally—above a lake alters the concentrations, gradients and evaporative fluxes of water isotopes, it alters the water balance and isotope ratios of the lake and the relationship between them. These effects are greatest for small lakes and decrease with increasing lake size along the wind direction. "Our results provide the first quantification of the effect of wind on the isotopic fluxes of evaporation," says lead author Xiahong Feng, a professor of Earth Sciences. "The method of mobile vapor analysis combined with 2-D modeling can be applied to other environmental settings in which the size of advection effect on isotopic fluxes depends upon relationships among local meteorological and hydrological variables. Our results also suggest that incorporating isotopic vapor measurements can help constrain modeled evaporation rates, which is worth exploring further in future studies."